LONDON • It was evident how far Manchester United's stock had fallen at Leicester, where the away Manchester City supporters were in full voice, trolling their cross-town rivals with "bring back (Jose) Mourinho" chants. They were jubilant after seeing their side beat Leicester 3-1 on penalties on Tuesday night to move into the League Cup semi-finals, with United having exited the tournament in the third round under their sacked manager. Despite making eight changes from their last game against Everton, the Cup holders remain on course for the third trophy of the Pep Guardiola era, although his players did not entirely have it their own way after the scoreline finished 1-1 in normal time. The Spaniard was indebted to rookie goalkeeper Arijanet Muric, who showed "veins of ice" to emerge as the hero in the shoot-out, keeping out two of Leicester's attempts from the spot. The 20-year-old Kosovo international has yet to play in the Premier League, with his three appearances this season all coming in the League Cup. But he was not the only relatively untested player to be given a run-out against the Foxes. 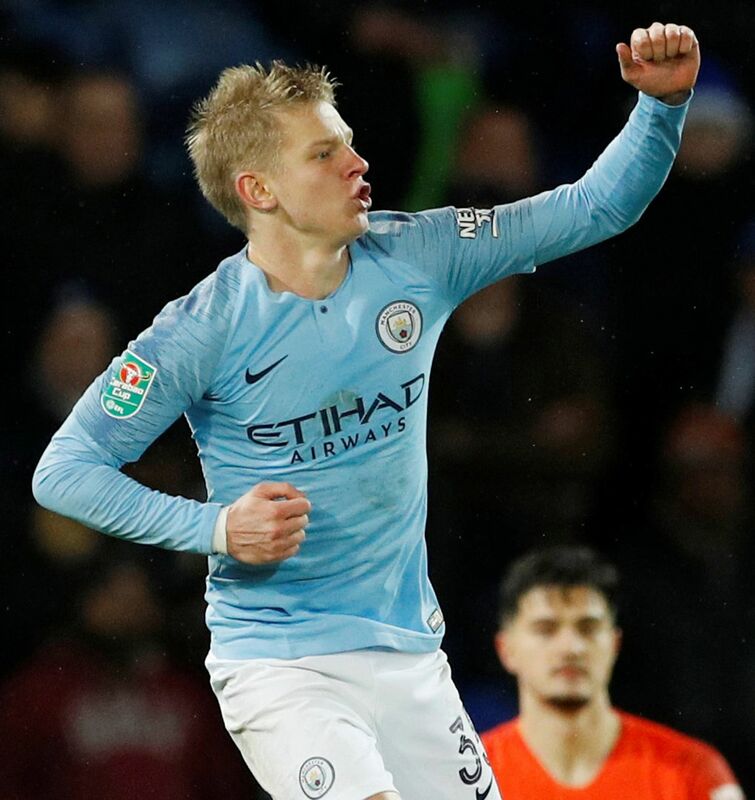 Spanish midfielder Eric Garcia also made his City debut and the 17-year-old's "huge personality" enabled the Premier League champions to gain a footing in the tie, striking first through Kevin de Bruyne. It was the Belgium midfielder's first goal for City since April and there was unbridled joy on his face, with the club's Player of the Year having endured a stop-start campaign after suffering two separate knee injuries. Although Marc Albrighton equalised for the Foxes in the second half, Muric repaid Guardiola's faith in him, stopping penalties from Caglar Soyuncu and James Maddison. Only Raheem Sterling erred for City, blazing his spot-kick over, while Ilkay Gundogan, Gabriel Jesus and Oleksandr Zinchenko made no mistakes. Guardiola cut a relieved figure afterwards, declaring the tie to be "a tough game" and admitting "it was always difficult at Leicester". However, he reserved special praise for both Garcia and Muric, insisting their displays vindicated his decision to blood them at the King Power Stadium. The 47-year-old told reporters: "Aro is so big, his reaction is so quick and he took the right decisions. It's good experience for him. He is a young guy, he is so shy, it's a nice moment. He deserves the big applause. "He (Garcia) has good vision, a good pass. He's so smart. It's incredible, I'm very pleased. I'm so delighted with his performance." De Bruyne, who made his first start since Nov 1, also hailed Muric's heroics as a "beautiful moment", adding: "To be out for so long and to play 70 minutes is a good sign for me. We want to win titles so there's two games more and we can battle for another trophy." In the other last-eight tie, third-tier Burton advanced to the semi-finals for the first time in their history after a shock 1-0 win at Championship side Middlesbrough through Jake Hesketh's winner.